Also - no US Hardbat championship this year? WTH? I watched the women's and men's final live streaming. My experience was that the production quality was lower than last year. Several times the stream broke up badly. In addition, it seemed they didn't spec out the lighting requirements for live streaming; at times there were many shadows, almost like a horror movie with darkness and mysterious bodies moving about. Some angles of view were not consistently lit. I hope someone can watch the Tennis Channel this afternoon (3-5pm eastern) and report what it all looks like on TV. It seems the production was completely geared toward that broadcast rather than the livestream. In any case, there were many awkward moments which suggested confusion and bad planning (by the producers, not USATT) - Prachi Jha being cut off and generally disoriented, the commentators talking over the women's winner interview, etc. Maybe they've fixed some of this in the editing for TV. Too bad indeed the matches weren't closer. Lily got very lucky with nets and edges (about 10-1 over the whole match), and Nikhil unfortunately couldn't win game 2. There is a hardbat men's singles event listed, with players. But i don't see any results. Totally missed that. Watched the finals last night, in my mind finals=end of tournament. It looks just as crappy on TV as it did on the live stream last night. The lighting is terrible for video. The players faces are very dark. This is not the way to promote tt. If I was a sponsor, I would be very annoyed that my sponsorship logos are not very visible. I would tell Gordy that the lighting is not acceptable and future sponsorship requires changes. If you want to light the playing area and keep the audience dark, it can be done. 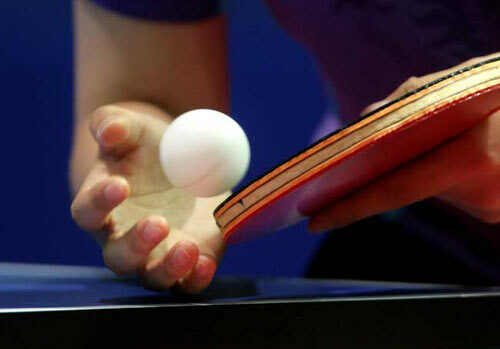 They need to talk to the people who put on the World Championship of Ping Pong sandpaper event and find out how they set up their lighting and cameras. USATT may not have the $$$ to do it this way. If not, they should ditch the light/dark idea completely. This is the USA. It's just ping pong. I agree, the lighting was poor. It could be they were trying to create a nightclub atmosphere, which I think would be a mistake. Overall I thought the tournament ran well. Last night was just warm-up, all the important events are today. The hardbat final should be happening right now on table 1. Unfortunately there's no stream for table 1 today. I agree with everything stated above. It looked awful. Odd, still no results posted for the Hardbat Men's Singles. It looks like any event that started on Saturday or was to conclude on Saturday doesn't have results posted. Thanks for the feedback everyone!!! I do appreciate it. I watched on Tennis Chanel and live - and agree that the live lighting, which was actually very good, did not translate as well as we anticipated, on camera. As with so many things we do - we will improve for the US Open and events beyond. 2017 hardbat champion is... Sharon Alguetti. Gordon, could you tell us -- what is exactly the reason for that strange lighting? is there any actual benefit that players, spectators and TV/Internet audience are getting from this? how is it better than the usual good lighting etc. ? I am sure there is some explanation... it's just we (people who weren't there) don't know what it is. The fact that a high level sponge player who devotes little to no time practicing hardbat won (for the second time I believe), is a pretty strong statement against those who preach that it is a more difficult or more technical game. Not speaking for Gordy, but here is why the LA Lakers do this. A few years ago the Lakers decided to dim the lights on the spectators, so the basketball court was well lit, but the spectators were not. They liked the results, so they kept doing it. They felt that the game was more of a spectacle centered on the players because your eyes naturally go to the brightest objects. Keep focus on the stars of the show. I expect this the same reason World Championship of Ping Pong does the same. BTW, I appreciate and encourage Gordy and crew to continue trying new things. Some work, some don't. Gotta try. I can tell you now that Gordon spent time with all of the players during their warmups on the final court to ensure that the lighting was in adequate condition for the players. The lighting levels were above standard and the players were all satisfied that the lighting was of a good level. I wasn't able to watch the Tennis Channel replay as yet or the stream apart from some spots, will take a look tomorrow. From a spectator perspective there were lots of shadows on the playing court. I think it is because the light was coming from directly overhead only, so when a player crouched over to return serve their face vanished in the shadows. Having the spectators dark is probably fine. Has the USATT listed, in a simple format, the players selected at the Nationals for the various national teams? I looked around some and didn't find a synopsis. Donn - we will be posting a special congratulations article this week. Tomother questions you guys have - I will get back to you tomorrow!!! All the results are posted for the U.S. Nationals now. Nice article. I would've made the title "Kanak, Kanak - Who's there? - The last 2 National champions"
If you are referring to a video of the Finals match, I hope to have that posted in a few days. Thanks. We've come in second to Dan and Patty twice before. Nice to finally get the win. Congrats Jay. How did the other MyTT members do results wise? Nothing appeared to have been fixed for TV broadcast. The filming and camera shot calling for the actual competition was pretty good. Prachi is currently not skilled enough to pull off what they asked of her. Unfortunately, her commentary came off mostly as unpolished and not very professional. Doing commentary like that is, I think, harder than it looks. You need experience and practice. Sean and his partner announcer did much better though his partner really botched the intro to the Men's Final. I was shocked that nobody fixed that prior to broadcast on Tennis Channel. The USATT "commercials", and instructional videos ranged from being very unprofessional (low audio on one channel only!! Background noise/hum that could have been removed or reduced in post. Horrible color correction that resulted in yellow skin tones) to somewhat unprofessional. None of it was particularly well produced. That said, some of the TT tennis promo spots delivered good messaging IMO. Kudos to USATT for getting on the Tennis Channel and having the actual competition look pretty good. Nice camera angles. Nice slo-mo replay. Decent commentating. But they did themselves no favors with much of the the other stuff.